People like to make fun of Spam, because it’s a strange product. I mean, you know. It’s mashed up, gelatinized, and highly processed pork that comes in a can. You know, your typical culinary delight. 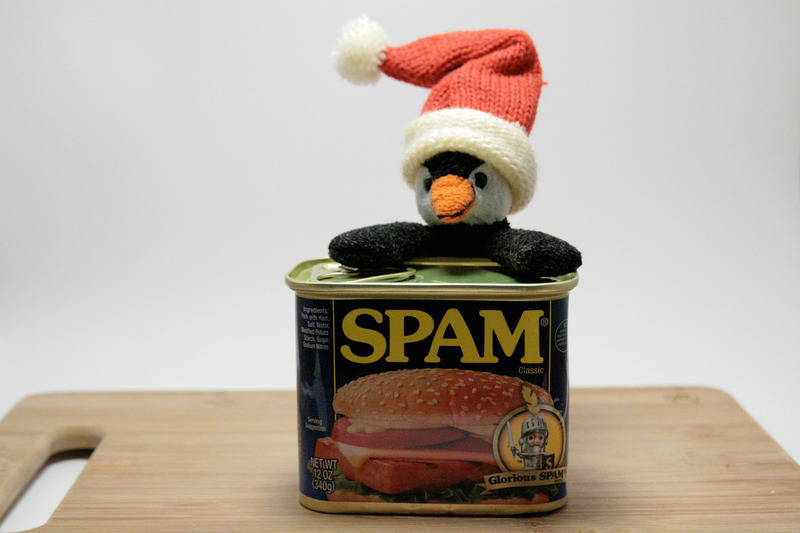 But in South Korea, where my family is from, Spam is a highly prized gift during the holidays. A lot of Western folk think that’s strange. And from the look in people’s eyes, part of me wonders if people here think it’s backwards. But the thing is, South Korea, as my mother and father explained it as I was growing up, was a third-world country. When my parents were kids, many people were malnourished and hardly had enough to eat. Looking at South Korea’s growth now, it seems strange, doesn’t it? Those third-world days weren’t long ago, when you think about it. Meat was prohibitively expensive back then — and if you think about it, a peninsula that is dominated by mountains (80%, in fact), isn’t the easiest place to raise livestock. So a small amount of meat was only for a special occasion. These days, you and I can go to a Korean barbecue restaurant any day of the week and eat meat till we’re sick, and we can still make rent. During the Korean War, Koreans were introduced to Spam by American soldiers, who had it in their military post exchanges. And even then, you could only get it if you had enough money. Nobody had enough money back then, so you were really lucky if you got a taste of the canned meat. A popular dish, known as budae jjigae, “Military Stew,” came from back in those days. It’s a weird stew, a spicy broth mixed with American cheese, ramen noodles, hot dogs, kimchi, and yes, Spam. For Christmas, as a carryover tradition, Koreans buy each other expensive Spam gift boxes. My mother told me that now, Korea’s on a bit of a health-food kick (from what it sounds like, it’s more of an obsession). So I imagine that Spam isn’t nearly as cool anymore since it’s loaded with salt, nitrites, and fat. But a piece of calorie dense Spam, some kimchi, and a fried egg, still makes a pretty delicious meal in my eyes. I know lots of friends who spend boatloads of money on fancy Michelin-starred restaurants. They complain when their wine pairings aren’t ideal, or if the truffles shaved over their egg pasta isn’t very flavorful. I don’t know how to respond to that sort of thing. When I go eat media dinners at those same places, I eat my sliced truffles and wish my friends and family were there to enjoy them with me. I mean, don’t get me wrong. Truffles are wonderful, but they don’t taste as good when you’re with a bunch of people who wish they tasted better. So during the holiday, when I walk down the aisle at the grocery store and see the can of Spam on the shelf, I think about how simple, salty, and delicious it tastes when it’s pan-fried. I also think about how cheap it is, and how people here think it’s trash food. I think about Korean tradition, and how our trash food is considered a treasure back half a world away, and I feel happy and maybe a little sad at the same time. Now that it’s Christmas. I know will eat well. But if all I had was a bowl of rice, kimchi, spam, a fried egg, and the people I love, it would be better than any truffle in the world. ← Which Bum Wines Pair Best with MREs? For our exceedingly classy Luau-themed New Years Eve party, I baked some homemade Hawaiian rolls stuffed with (small slices of) Spam and Velveeta. Without fail, every one of my friends (my wife included), when they heard about that, visibly cringed or made some kind of disparaging comment. At the party, the rolls hardly hit the table before they started to disappear. They were delicious. I’d love to try spam in a Korean dish, some kimchi fried rice or the soup you mentioned. Sounds great! Anyway, love the site, Happy New Year!